The snake pit is a small set of bommies located a short distance fromlizard Island. The snake pit has two bommies that come up to about 8 M from 25 M. Around these two bommies are coral formations thatform a sort of border around the divesite just before the bottom rolls off to the deep. One great fieature of snake pit is that it is a manta ray cleaning station. The manta rays come in for a cleaning and if everyone remains still, the manta rays WILL come in for a closer look! Snake pit features sea snakes (of course). 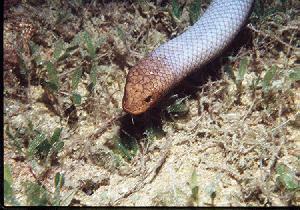 Sea snakes are very curious creatures and will not harm you if you do not provoke them. Do not try to touch a sea snake, as with any wild animal the results can be unpredictable. Other creatures that can be found at the snake pit are octopus, many small reef fish, crown of thorns starfish, ribbon eels, nudibranchs, lionfish, manta rays, and eagle rays. A dive at the snake pit is usually done after diving the cod hole. This reduces the dive profile in term of depth that the diver should go. For a dive at the snake pit this is usually important. There are some deep areas around the snake pit but there is not much to see. Most of the sea life is above 60 feet. The best dive profile around the snake pit depends on visibility. When the visibility is low there is a good chance that there is enough food in the water for a manta ray. The manta ray cleaning station is a wide coral bommie away from the main diving area. Waiting in this area can produce manta sitings, if one is patient and does not move quickly. The other way to dive the snake pit when the visiblity os good os to swim around the twin bommies following an excursion to the deeper end of the dive site. At this end of the dive site one can usually find a sea snake or two, and several lionfish. Follow the ridge of coral formations for a short distance and then turn back toward the bommie. Circle the bommie, starting at the bottom. I have found many inteesting creatures at the bottom of the bommie where the twin bommies meet. In this region there one can find octopus, ribbon eels, crown of thorns starfish, and sometimes a sea snake. Contiue following the bommie until reaching the top of the bommie. At the top of the bommie there is an amazing assortment of coloer simalr to Pixie's pinnacle. Near te top of the bommie there are many nudibranchs.